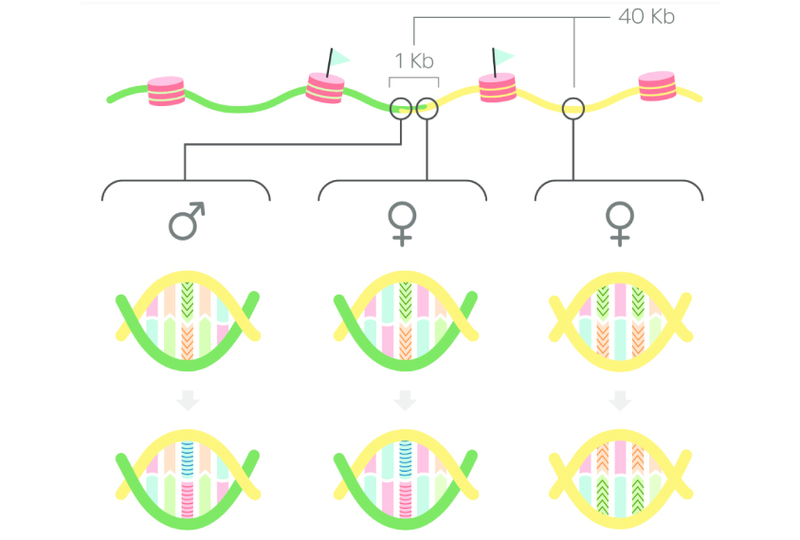 Trading places: A new map of human genetic variation shows that spontaneous mutations cluster near sites where chromosomes swap DNA. One map pinpoints ‘hot spots’ at which a process called recombination — which gives rise to genetic diversity — is most likely to occur1. The other details sites at which stretches of DNA are duplicated, deleted or inverted2. In the process of making eggs or sperm, pieces of DNA shuffle, or ‘recombine,’ between pairs of maternal and paternal chromosomes. De novo mutations — those present only in the child — are often present near these hot spots. Hundreds of de novo mutations have been tied to autism. Researchers typically map recombination sites using microarrays, which detect variations in single base pairs. But the approach has a low resolution: It can only map sites to within roughly 1,300 base pairs of their actual location. To create a more precise map, researchers in Iceland used microarrays on the genomes of 155,250 people connected as parent-child pairs. They then sequenced the genomes of 28,075 of these individuals to pinpoint the recombination sites. They also located de novo mutations by comparing the genomes of children with those of their parents. The resulting map includes 4,531,535 recombination sites and 200,435 de novo mutations. It has nearly the twice the resolution of similar maps. The de novo mutation rate is 50 times higher than the background rate within 1,000 base pairs of a recombination event, suggesting that recombination events have a mutagenic effect. The scientists also looked at the effect of age. They found that de novo mutations accumulate with age, and do so faster in men than in women. Recombinations also accumulate with age, but only in women. The results appeared in January in Science. In a separate study, researchers identified 99,604 common ‘structural variants’ in the human genome, 40,654 of which were previously unknown. Structural variants include insertions, deletions and inversions of more than 50 DNA base pairs. The researchers mapped these variants’ locations by lining them up to similar sequences in the human reference genome. About 70 percent of that reference genome is derived from a single individual. As a result, it only captures a miniscule fraction of human genetic diversity. The new map combines sequences from 15 individuals from four continents. Of the variants sequenced, 15,291 appeared in at least half of the participants. The results appeared in January in Cell.